Pick up the phone and call (201) 327-5258 today for high quality Ramsey asphalt milling services. We will send one of our asphalt specialists over to give a free estimate and offer a comprehensive solution. Click here if you’d like access to current online coupons. Asphalt is a highly effective and budget-friendly paving method with a multitude of different applications, but it never remains the same for long periods of time, requiring adjustments, repairs and replacements. The elements and the wear and tear of the traffic that uses the surface make regular maintenance and upgrade a necessity. One of the services that many paving contractors offer is called asphalt milling. 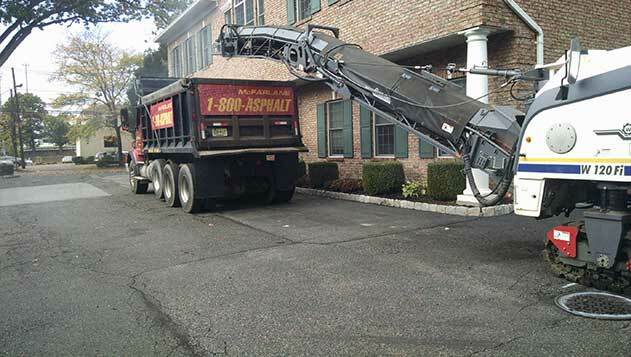 Our asphalt and paving services are popular for a reason. Click here to find out what others are saying about us! Asphalt milling is a service that consists of removing part or all of a paved surface. The process can remove a small amount of the surface, so it may be levelled and smoothed, or it can remove the entire depth of the surface. When you contact your local paving expert, they will let you know the best course of action to take to correct whatever issues are happening with your asphalt surface. One of the primary reasons an asphalt surface is milled is to recycle the pavement in order to be ground up and used as aggregate for new pavement. This method of recycling the paved surface reduces the impact full resurfacing may have on the environment. By grinding up and reusing what is already there to make more, it allows contractors to lessen their environmental impact. Asphalt milling may also be used to remove physical defects from the pavement. These include raveling, where the aggregate and binder have been separated; bleeding, where the binder comes up to the surface; or rutting, which refers to slight depressions or low spots. This usually occurs on roadways along the wheel path. If the asphalt surface has been damaged by an accident or fire, milling can be used to level it off and clean it up. Milling is also an effective technique to help control the actual height of a roadway. The road height may need to be changed to control the clearance of manholes, curbs, catch basins and guardrails. It’s also used to change the slope of the road if there are issues with drainage that need to be changed. If your asphalt surface is in need of work and you aren’t sure where to turn, call McFarlane Asphalt at (201) 327-5258 in Ramsey, NJ and the surrounding area for expert help you can count on.